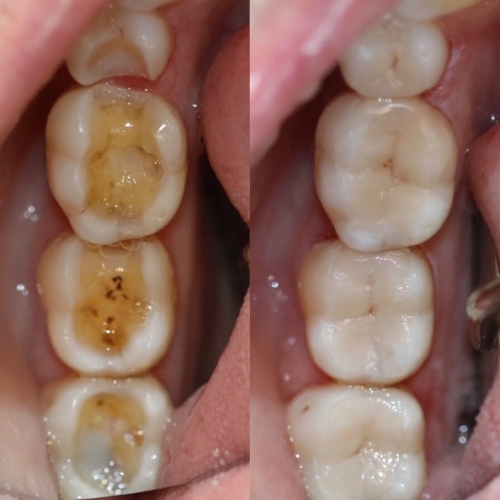 3D printed porcelain restorations are strong, durable and have the best aesthetics for teeth that have been damaged and that are carrying very large fillings. Porcelain inlays rebuild teeth in a durable, precise and with the best aesthetics. Computer generated porcelain restorations are seamlessly bonded and precision fit to the rest of a damaged tooth, and feel perfectly smooth and just like tooth structure. They are strong, durable and stable, and they allow for the shape of teeth and colour of teeth to be changed. They have a machined finish like glass, and is biologically superior because it is naturally stain free, and does not attract plaque. Porcelain inlays are precision fit and made by a master ceramist in Australia, and matched perfectly to the rest of the teeth by your dentist, for the very best aesthetics in the most durable way possible.